Get free advice and estimates from fireplace contractors in your city. Whether it’s the decorative statement a fireplace adds or the warmth and coziness of a wood fire that appeals to you, fireplaces are very popular additions to homes. In fact, fireplaces can add $5,000 to $12,000 to the value of a home, depending on location. Many options are available for in-home fireplaces, including gas fireplaces and wood-burning stoves. In this guide we will explore the differences between stone and brick masonry in wood-burning fireplaces. Because a fireplace is the immediate focal point of any room, the choice of brick or stone depends largely on the first impression you wish to make. Below we discuss other factors to help you decide between brick or stone for your fireplace. The easiest time to install any fireplace is during new construction. It can be done as a home addition, but it is a more expensive endeavor since modifications to the home must be made as well. The installation of both new and added fireplaces requires knowledge of local codes, permit procedures, and ordinances. It is also a skilled, labor-intensive process and is therefore usually best left to a professional brick or stone mason. The consistent shape and size of brick makes calculating the needed materials for the fireplace easier. Also, the geometric uniformity of brick makes installation simpler than the random size and shape of natural stone, meaning it is less expensive. In fact, a brick fireplace can be installed by one person alone, saving in labor costs. The weightier mass of a stone fireplace requires at least two people for installation. Skill at brick laying is not enough to install a stone fireplace because even a minor mishap during installation can require starting over. The unique quality of stone, especially natural stone, makes its installation more labor intensive. Each stone must be chosen for its shape and size, then cut and chipped to fit the surrounding stone. Also, only someone experienced with stone installation can predict the weight of stone needed for a specific fireplace. Installation is, therefore, more expensive than brick. How much more expensive depends on the type of stone used — natural or crafted, rare or common, foreign or domestic. The cost of brick material varies widely, but it is far less expensive than stone across the board, at least 30 – 50% less. Reclaimed brick is more expensive than new brick unless it is reclaimed by the homeowners themselves. One reason stone costs more than brick is stone is sold by weight, but brick is sold by unit. Shipping stone from the source can be prohibitive as well. As stone is a natural material, its colors can vary. Therefore, it is recommended to buy more material than you need for the installation in case you need some for future repairs. This is not necessary with brick. Even the mass-produced cast stone variety costs more than brick, although it is less expensive than natural stone. Manufactured stone is lighter in weight, and its size and shape are more predictable. Its use is not limited to certain locations because of prohibitive shipping costs either. The material to build a stone fireplace will cost 20–60% more than bricks for the same fireplace, even allowing for the more dense fire bricks used near the fire itself. An average brick fireplace will cost $3,500 to $5,000 while an average stone fireplace will cost $4,550 to $7,500. A well-installed brick or stone wood-burning fireplace can last over 100 years, so this is an investment that will be a near permanent part of the home. 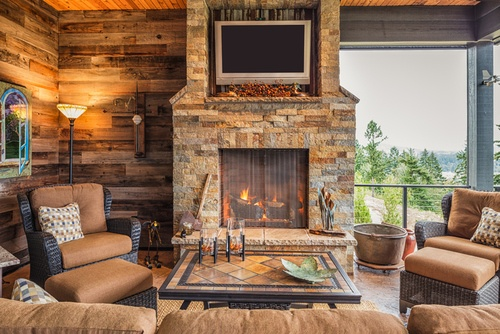 Since both materials, brick and stone, are long-lasting and strong, the choice between brick and stone for a fireplace will often fall heavily on design factors. Brick can give a sense of strength and warmth to a room. Stone, on the other hand, adds a more natural aesthetic to the room’s atmosphere. Bricks are available in a wide variety of colors and textures, including both new and reclaimed. This allows the designer to match any room style, from traditional to contemporary. At the same time, brick is not always the choice for someone seeking a high degree of individuality. Its standard sizes and limited patterns can cause some people to desire a more random stone arrangement for their fireplace. Stone can also blend with a room’s decor better because of the natural variations in color. Stone may be either natural stone or cast stone. Natural stone types are granite, marble, travertine, slate, and limestone. Limestone is particularly expensive if it is carved to make a custom design. Cultured or cast stone is manufactured to resemble natural stone using cement, dye, and stone aggregate. It can resemble all of the natural stone varieties, even river rock. While not as long lasting as natural stone, most manufacturers offer up to a 50-year guarantee on their products. A sealant applied to a stone fireplace after its construction will prevent soot and other stains from marring the finish. Cleaning requires merely a cloth and warm water. Brick, on the other hand, is more porous than stone and cannot be sealed. 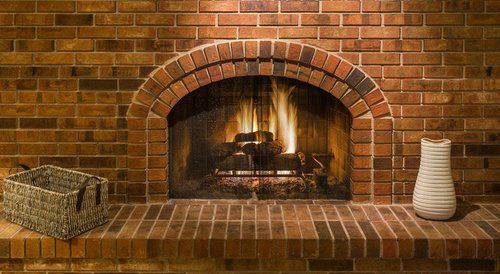 Therefore, a brick fireplace is more susceptible to stains and requires more regular maintenance. Despite their outstanding record of durability, both bricks and stones can become damaged over time. Because of the regular design of brick, damage is easier to repair, and they are easier to replace. Stone, except for small cracks, is much more difficult to repair. How much does it cost to install a brick or a stone fireplace in my city? Cost to install a brick or a stone fireplace varies greatly by region (and even by zip code). To get free estimates from local contractors, please indicate yours.